GR Engineering was appointed to undertake the engineering, design, procurement, construction and commissioning of the new process plant facilities and associated infrastructure at the Sinclair Nickel Project. The plant treats 300,000 tpa of ore to produce a saleable nickel concentrate. The process plant is designed to enable the initial processing of a supergene ore blend. Consideration in the design is also made for the subsequent processing of a primary ore blend. Blended ore is processed through a conventional crushing and grinding circuit followed by sequential flotation of the nickel minerals. The ROM ore pad is managed to facilitate adequate blending of the ore prior to presenting to the plant. The plant consists of run of mine (ROM) ore storage; single stage jaw crushing and crushed ore stockpile; primary grinding using a SAG mill; flotation and concentrate regrinding; concentrate thickening, filtration and storage; tailings thickening, disposal and water return; reagent mixing, storage and distribution; and services including water and air. GR Engineering commenced the EPC design and construction of the process plant facilities in September 2007 and completed the project, on schedule, in October 2008. GR Engineering Services is pleased to announce that the Sinclair Nickel Project achieved practical completion on 8 October 2008. The Sinclair Nickel project achieved a significant milestone on Wednesday 14th May with the transport to site and placement of the project's two fully refurbished grinding mills. 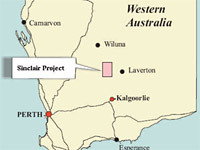 Location The project is located approximately 81 km west of Leonora in the north Eastern Goldfields region of Western Australia.